Forces loyal to Syria’s President Bashar al-Assad gesture as they advance into the historic city of Palmyra in this picture provided by SANA on March 24, 2016. DAMASCUS, Syria – Syrian government forces pushed into the ancient town of Palmyra, where Islamic State of Iraq and Syria militants appeared on the verge of collapse Thursday, while in Iraq, a military spokesman announced the start of a long-awaited operation to recapture the ISIS-held northern city of Mosul. The extremist group has been losing ground in Syria and Iraq for months under a stepped-up campaign of U.S.-led and Russian airstrikes, as well as ground assaults by multiple forces in each country. The retaking of Palmyra – a UNESCO world heritage site whose fall to the militants last May sent shock waves through archaeological circles and beyond – would be a significant victory for the Syrian government. But the operation to unseat the group in Mosul, Iraq’s second-largest city, is likely to take much longer and be far more difficult. The advance on Palmyra came after government forces, backed by Russian airstrikes, managed to capture several hills and high ground around the town this week. The Britain-based Syrian Observatory for Human Rights said Syrian troops and Shiite militiamen helping them on the ground were facing tough resistance from ISIS extremists as they try to penetrate the town’s limits. ISIS instructed residents to leave the town Wednesday, according to a Palmyra native who asked not to be named. The town was mostly empty Thursday, save for ISIS fighters who were reported to be mining homes ahead of the advancing army. 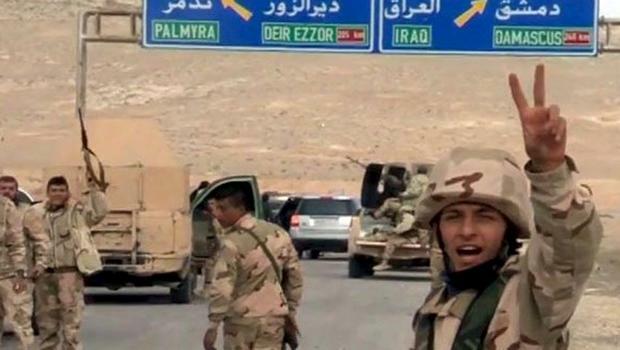 Many of those who left sought refuge in ISIS-controlled cities in the country’s north and east, including Deir el-Zour, which is also being contested between the extremist group and government forces, according to opposition media activists. Affectionately known as the “bride of the desert,” Palmyra had attracted tens of thousands of tourists to Syria every year. But ISIS militants destroyed many of the town’s Roman-era relics, including the 2,000-year-old Temple of Bel and the iconic Arch of Triumph, and also killed dozens of captive Syrian soldiers and dissidents in public slayings at the town’s grand Roman theater and other ruins. Besides blowing up priceless archaeological treasures, ISIS demolished the town’s infamous Tadmur prison, where thousands of Syrian government opponents had been imprisoned and tortured over the years. The advance on Palmyra comes against the backdrop of Syrian peace talks underway in Geneva between representative of the Damascus government and the Western-backed opposition. The talks, which have been boosted by a Russia-U.S.-brokered cease-fire that has mostly held since late February, were to adjourn on Thursday – without having achieved any apparent breakthroughs. Meanwhile, in Iraq, government forces pushed ISIS fighters out of several villages outside the town of Makhmour, southeast of the IS-held city of Mosul – a move that Iraqi and coalition officials cast as the start of an operation to retake the strategic city. The small U.S. artillery outpost near Makhmour has expanded the number and combat exposure of American troops in the country as Iraqi security forces prepare for a counteroffensive to retake Mosul, which fell to ISIS during the militants’ June 2014 onslaught that captured large swaths of northern and western Iraq and neighboring Syria.